Messerschmitt 109 G-0 V48 was 4 km/h faster than standard model. It is possible that for equal effect the Vee-tail requires greater material and hence weight than a conventional arrangement, but I've not seen any full accounting for this. However the Vee tail was considered for a number of other aircraft and rejected: I don't think this can purely be dismissed as an unwillingness to consider the unusual. Supermarine tried it with a prototype that became the Scimitar. Vickers Supermarine 508 experimental twin jet naval fighter VX133. The tail section was at Lee-on-Solent in 1978. Don't know if its still around. Last edited by Muscle-Manta; 3rd April 2019, 17:09. I saw the 508 prototype at the Predannack fire dump when it was fully intact in the 1970s. I wrote a letter to Flight at the time suggesting that it be preserved as a museum piece. A V-tail is often not very efficient in yaw, and requires a larger, total surface than a conventional lay-out offering the same controllability. All of this adds unpopular weight. The Bonanza's V-tail became unpopular due to cracks being found in them, but this was not attributable to the V-tail lay-out as such (cf. the Magister). I think some UAV's have V-tails, as does the Cirrus Vision Jet. The latter however has this configuration to accommodate the jet engine on the top of the fuselage, and the tail surfaces have a quite impressive length. Last edited by Kenneth; 3rd April 2019, 20:32. Coincidentally, for years Beech quoted the speeds for the V-tail Bonanza 3 mph faster than conventional tail models. The V-tail models were generally thought to have less directional stability (evidenced through "fishtailing") than conventional aircraft. While some Bonanzas may have had structural issues as they aged (remember, the earliest models were built in 1947, and due to popularity, performance and its reputation for quality, even the earliest models are still flying today...In other words, you won't see one abandoned in the weeds or WFU) remember that it was fairly unique in its class to be licensed in the CAA/FAA's stronger "Utility" category instead of the usual "Normal" category...the difference comes out to about a 16% increase in structural strength. While the V-tail may not have flown in the Brabazon, but it did fly in Beech's four-engine airliner prototype, the Model 34 Dual Quad. Last edited by J Boyle; 4th April 2019, 12:10. The V-tail models were generally thought to have led directional stability (evidenced through "fishtailing") than conventional aircraft. While some Bonanzas may have had structural issues as they aged (remember, the earliest models were built in 1947, and due to popularity, performance and it's reputation for quality, even the earliest models are still flying today...In other words, you won't see one abandoned in the weeds or WFU) remember that it was fairly unique in its class to be licensed in the CAA/FAA's Utility category instead of the usual "Normal" category...the difference comes out to about a 16% increase in structural strength. So if you solve the fishtailing issue you can use the V-tail. How about a flying wing..it reduces the drag by 20% of not having the tailfeathers at all ? V Tails do not really work in practice anyway,one either ends up with a longer fuselage,and/or larger tail surfaces to get reasonable stability and control,so you end up with very little overall drag reduction and with a structural weight increase. For a light aircraft you also end up with a fairly complex 'mixer' control unit to get the correct mix of pitch/yaw control deflections. Yes this is well known by now. What if these issues can be solved...when someone just concentrates on the subject thoroughly and starts experimenting ? Off topic, but would like to comment something “bazv” wrote. Yes and no. Depends upon the type of wing design. Those such as the Fauvel gliders that use reflex aerofoils can work well. Certainly the AV36 is a delight to fly. On the other hand, the Horten designs primarily used wing platform shape to maintain control and stability throughout the flight envelope; that is more difficult to get right. As “basv” notes, computer control and fbw can be used to great effect where money is not an issue. What if? What if butters no parsnips. Wishful thinking and lists of ifs buts maybes do not influence the behaviour of the air around shapes. What makes you think that no-one has concentrated on the subject thoroughly before now? Have you been through the libraries of NASA and the RAE, not to mention their Russian and French counterparts? (Or German, Japanese, or any other nation that has seriously studied aircraft of different configurations). Comments above about handling problems and inbuilt limitations of the configuration are not something dreamed up to avoid seeking answers to these problems, but built on actual experience of flying such configurations, testing models in wind tunnels and carrying out intense flow computations. What if someone just concentrates on the subject of anti-gravity thoroughly and starts experimenting? Sorry, does that seem silly? The 508 had a butterfly tail as it was derived directly from the 505, which was had no undercarriage and designed to land on sprung deck surfaces. The tail reduced the risk of damage on landing, and in a similar way the few Supermarine flying boat projects that also featured similar tails did so to keep the surfaces clear of spray. I have no doubt that many people have tried to solve mysteries around flying wing..not just Hugo Junkers, Horten brothers and Jack Northrop. I have also seen lotsa people fail in trying to solve the problem of developing more efficient vertical axis wind turbines..like McDonnell Aircraft for instance in the seventies..and Vestas and returning back to propeller type horizontal axis wind turbines...all except ANEW in Poland who boasts with 50% more efficient wind turbines than the previous can boast with. The small domestic turbine look as if it will meet my needs. Thanks for the tip. It is quite easy to answer. If you are an active pilot, you can compare the Bonanzas directly. One is going like a train on tracks, the other one is always slightly swinging around it´s vertical axis. If somebody likes this behaviour, he should prefer the V35. Most of us didnˋt. Also I flew two gliders with V tails. The SB5 and the SHK. Both are very nice aircraft. But tell me one reason why anybody prefers an aircraft, which is less stable than others. Except you need something highly manouverable or you like to have more workload if you simply want to fly straight ahead. I agree that replacing the 3 plane tail with V-tail like in Me-109 G-0 like above is not the way to go..you also have to reshape the fuselage. Do you reside in Poland ? The concept of a V shaped empennage was first envisaged in 1910 by two Germans from Wallsee, Hopfenwieser and Höfinger. They began construction of a fuselage with such a tail unit. There does not seem to be any evidence that any aircraft incorporating this device was completed or any tests carried out, the idea being abandoned and forgotten. In the the late 1920’s, Jerzy Rudlicki (https://en.wikipedia.org/wiki/Jerzy_Rudlicki) was exploring ways by which a gunner defending an aircraft from the rear could be improved. Rudlicki, who was completely unaware of Hopfenwieser’s and Höfinger’s work, began to pursue the idea of an empennage consisting of two inclined elements in place of a conventional tail. In the course of preliminary investigations of the system various configurations, including A, W and M forms, were studied, which showed the V layout to be the most promising. In 1930, at the Warsaw Aerodynamic Institute, extensive comparative wind-tunnel tests of conventional Rudlicki V-tail began. These fully confirmed the designer’s expectations. The results of these tests combined with detailed design investigations revealed that as well as improvements to the field of fire, the system had better efficiency, aerodynamic advantages and a reduction of 35% of the dead weight of the tail structure. All this encouraged E.Plage & T.Laśkiewicz to test the empennage in the air. In early 1931 work commenced on an experimental of Polish built Hanriot H.D.14 serial no. 30.83 which incorporated the Rudlicki V-tail. The aircraft became the first aircraft in the world to fly with what is popularly known as a ‘butterfly tail’. Władysław Szulczewski began flight trials in early summer 1931. Factory tests proved very successful and completely trouble free and upon completion the Hanriot was transferred to the I.B.T.L in Warsaw. There it was comprehensively evaluated by the Institute’s pilots Kazimierz Kaźmierczuk and Col. Jerzy Kossowski. Neither of the pilots found any difficulty in converting to the Rudlicki V-tail system and all reports stressed the handling characteristics of the aircraft were comparable or superior to those of standard machine, controllability in flight and on the ground being particularly good. Despite this, the Department of Aeronautics, for reasons known only to itself, did not approve the invention. When Lublin built the R-XIX incorporating the Rudlicki V-tail the Department reprimanded the factory and instructed it to abandon all further work on the system. Although dismissed in Poland, Rudlicki’s invention attracted attention abroad. 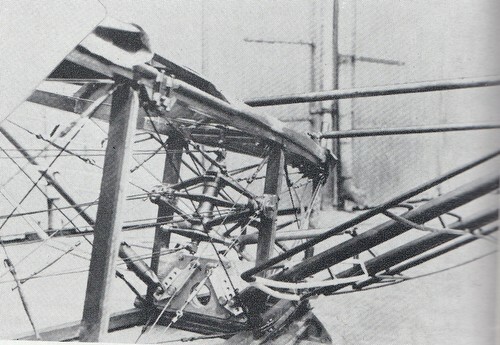 The RAE was engaged in extensive research into improving spin recovery characteristics, particularly the Bristol Bulldog, and showed considerable interest in Rudlicki’s V-tail. Experiments with models were carried out at the RAE’s Free Spinning Tunnel and Rudlicki was invited to Britain to discuss the the issues involved. Initial experiments suggested that there was no particular merit in the system as an anti-spinning device, but A.V.Stephens, who conducted the research, noted that their outcome was not entirely conclusive. Another series of test was devised but not carried out. Some research was also carried out in France, Russia, Germany and Italy, the Rudlicki-tail was installed on the French Blériot-Spad 992 and Mauboussin research biplanes and experimental conversions of the Russian R-5 and U-2 (Po-2) biplanes. In adapting the Rudlicki V-tail to the Hanriot, the same rudder pedals and control column were retained by introducing a special transmission box which enabled the pilot to fly the machine employing the same operations he would use in controlling a conventional aircraft. Backward and forward movements of the control column operated the moveable tail surfaces together as elevators. Lateral movements controlled the ailerons in the ordinary way. The differential gearing in the transmission box permitted the pilot to operate the moveable tail surfaces differentially by normal movements of the rudder pedals. The transmission box itself was small and very light, carried in the rear of the fuselage near the tail. From each side of the box two axles connected by leavers extended to the moveable tail surfaces. By means of the levers the mechanism was connected to the normal system of control, one lever being connected to the control column and the other to the rudder bar. Movement of the first lever caused the surfaces to move in the same direction, while movement of the latter caused them to move differentially. Dipl. Ing Zygmunt Zakrzewski, managing director of the Lublin works, impressed with the results on the modified Hanriot H.D.14and the widespread international interest in the Rudlicki, approved Rudlitcki’s ideas concerning a V-tailed version of the R-XIII, which offered the best solution of defence against attack from the rear. As the Department of Aeronautics showed no enthusiasm for the project, development was undertaken by the company as a private venture. Extensive wind-tunnel tests with scale models embodying V and A-type configurations of the tail surfaces were conducted at the Warsaw Aerodynamic Institute and the V-tail eventually chosen as the more efficient. In late 1931 the R-XIII prototype, serial 56.1, was returned to Lublin for a complete overhaul an brought up to full Lotnictwo Wojskowe standards. The factory management decided to rebuild this machine at its own expense to serve as the R-XIX prototype. 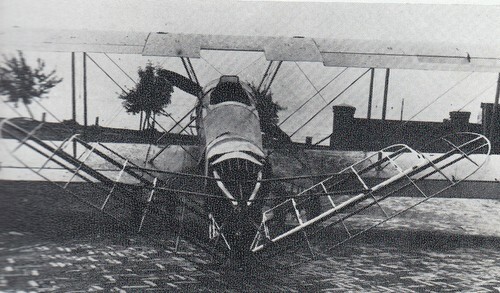 The R-XIX flew in the summer of 1932, and after comprehensive air tests at the factory, mainly conducted by Władsław Szulczewki, arrived unannounced in Warsaw to be demonstrated at the I.B.T.L. Col Kossowski was present and immediately offered to take the aeroplane for a flight. He then proceeded to put the aircraft through its paces with breath-taking aerobatics and on landing expressed a very favourable opinion on the design. This was to infuriate the the Department of Aeronautics who severely reprimanded Kossowski for flying the aircraft without permission and for expressing a positive opinion which did not coincide with with that of the Department. Zakrzewski was summoned to learn off the Department’s displeasure and the factory was punished by being fined for failing to deliver the overhauled R-XIII to the LW on time. Further flights of the R-XIX were strictly forbidden and on the Department’s order the offending tail was sawn off and the airframe sent back by rail to Lublin. Last edited by antoni; 7th April 2019, 16:25. I think the Beech designers, and those who have owned or flown the 10,000 (+ or -) V- tailed Bonanzas would disagree with you. And unlike the flying wing you compared it to, the Bonanzas didn't require a load of computers to remain controllable. It may have fishtailed, but it worked and was no less controllable than many other types out there (many types had handling quirks of various degrees).